A lovely, traditional Christmas gift or decoration. Children will enjoy icing the house too. Preheat the oven to 180°C/gas 4. Sift the flour, baking powder and spices into a large bowl. Over a gentle heat, stir the butter, salt, sugar and treacle together until smooth; add to the bowl and mix to a dough. On a floured surface, roll out to 5mm thick. Using the templates, cut out 4 walls and 2 roof panels; cut a door out of the front wall. There should be enough dough left to make 12 gingerbread men. Space out on lined baking sheets. Bake for 12–15 minutes, until the edges are darker brown than the centre. Cool for 5 minutes, then move to a wire rack. Add 3–4 tbsp cold water to the icing mix and whip with an electric whisk for 8 minutes, until peaks form. Transfer half to a piping bag (try using Cooks' Homebaking disposable icing bags) with a small nozzle and use it to stick the 4 walls of the house together. 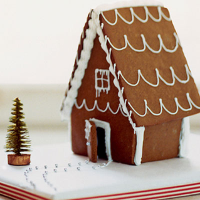 Stand the house on a plate and use full tin cans to prop the walls up until the icing dries. Pipe more icing along the top of the 4 walls, stick on the roof and leave to dry. Stick the door on. Put the remaining icing in a new piping bag with a fine nozzle to add icing details to the roof and walls. You will need a paper template to make this house; for instructions see waitrose.com/house. This recipe was first published in Mon Dec 01 00:00:00 GMT 2008.